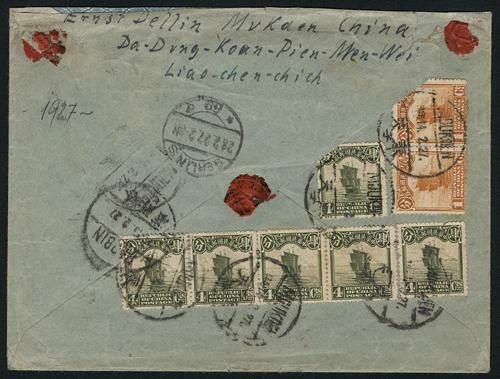 1927 (Feb 14) Moukden to Germany registered cover, via Siberia, franked on reverse Junk issues 1c pair and 4c x 6, tied by Moukden bilingual cds., along with Harbin transit and Berlin arrival. Just less than one month before the issue of Kihei Use Junk stamps. 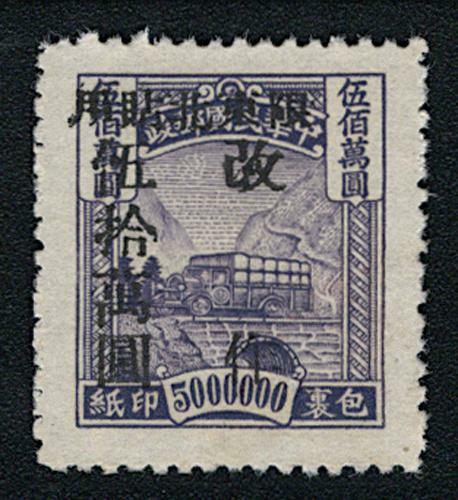 VF-F.
1948 Parcel Post Stamp surch Limited For Use in North East $500,000 on $5,000,000 (Chan NEP7), unused without gum as issued. VF-F. Ex. Lin Song. A group of governmental and civilian correspondence, content including criminal case record, report and purchase invoice. 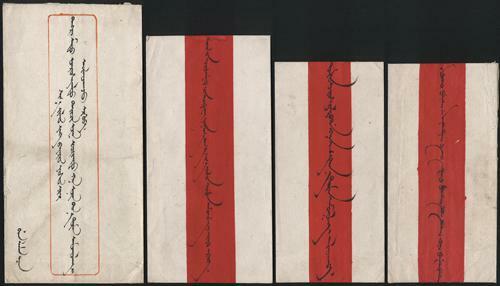 A group of 7 red band covers written in Mongolian, and handle by couriers, an interesting group. 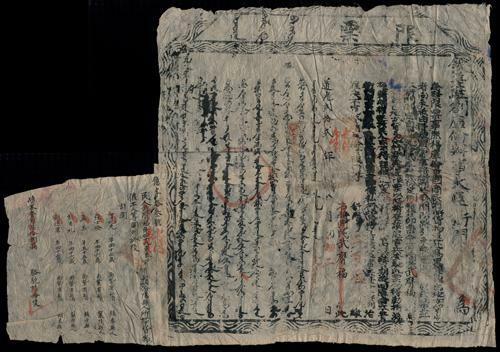 1900s a collection of 4 tax payment certificates issued by Minister of Kulun, Suitable for border commercial activity studies. 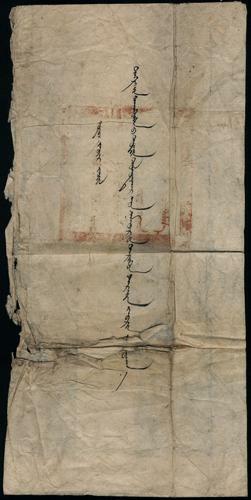 19th century Mongolian governmnet script, rare. 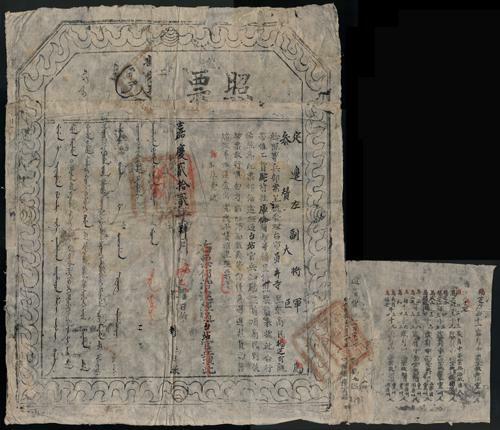 19th century emigration permit issued by Minister of Kunlun, unused. Rare. 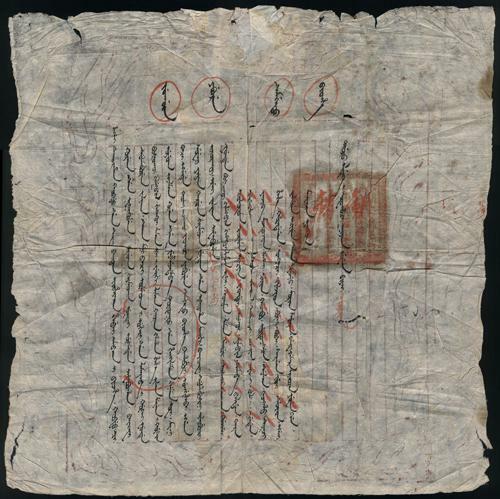 19th century a collection of tax returns, for cross-border trade. Suitable for border commercial activity studies. 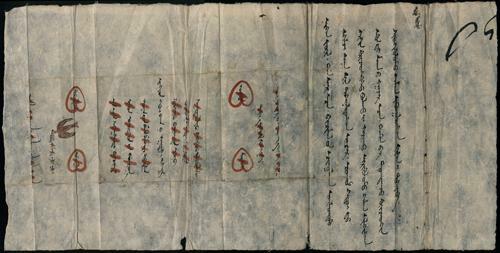 19th century cover addressing to Minister of Kulun, with Wax seal on reverse. Scarce. 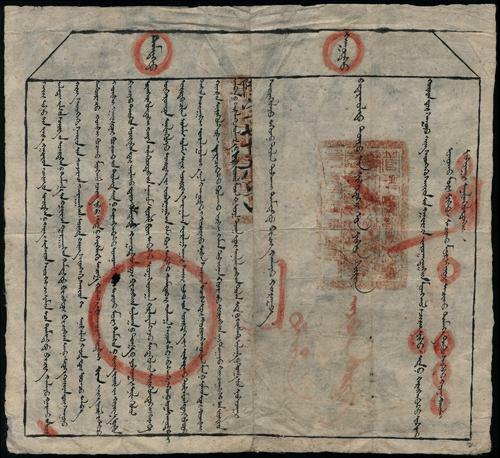 1753 Script from Namjildorj to the commander in Tusheet Khan province, Namjildorj is the assistant in charge of cases of stamp of Khoshuu and Jun Van of the state who is eligible to visit the king (Shadar dor yavax). 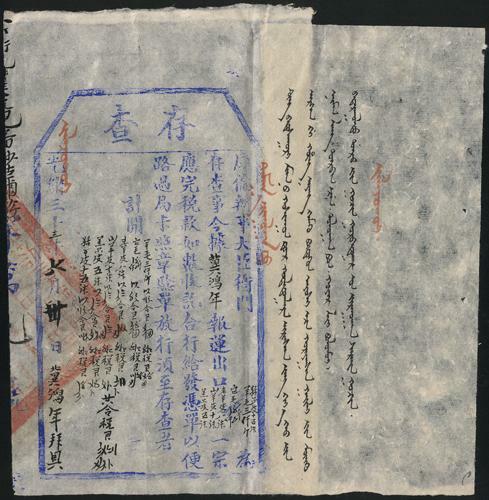 1817 emigration permit issued by Mongolian general, applicant was merchant. Rare. 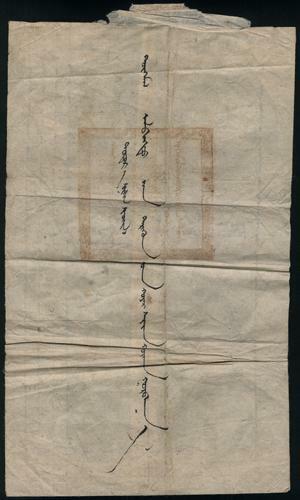 1830 Government Notice in Mongolia, an interesting group. 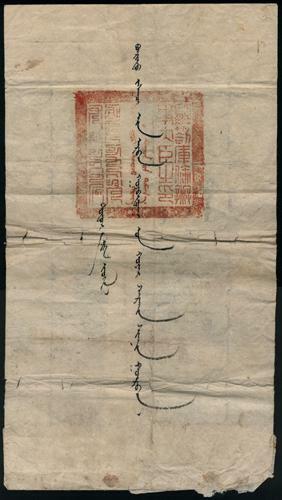 1835 emigration permit issued by Minister of Kulun, applicant was merchant. Rare. 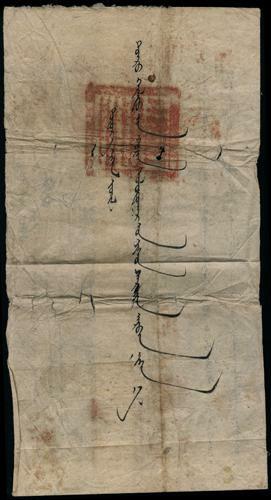 1836 Sealed script from Khobdo to the capital city, it is written that this script must be sent without any delay or barrier through all ward relay station. Rare. 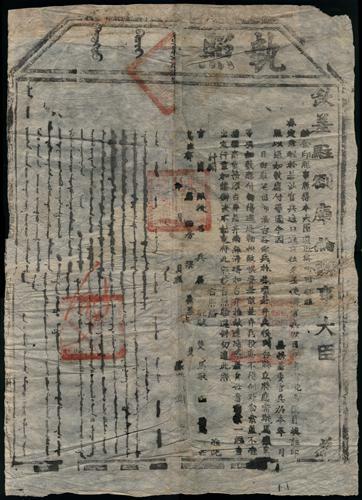 1842 emigration permit addressed by Minister of Kulun, applicant was merchant. Rare. 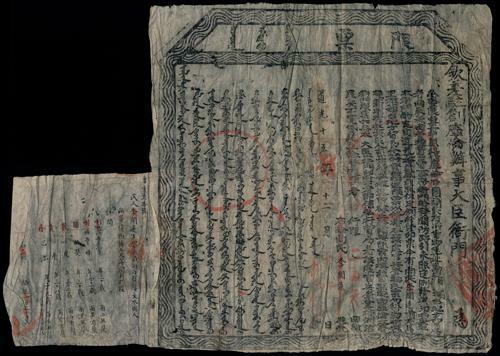 1848 Official large size cover from Erdeneshanzab, Erdeneschanzab is responsible for cases of the capital city of Javzandamba Saint who raises religion, delights animals and assists Graf Da Monk. To the authority Chin Van Ochirbat Tusheet Khan of khalkha, chairman of Khan-Uul assembly is eligible to visit the king (Shadar dor yavax). 1851 Official covert from Unenkhishig to the Tusheet Khan Ochirbat, Tusheet Khan Ochirbat commands the soldiers of east hand of Khalkha and is also the chairman of Khan-Uul assembly. 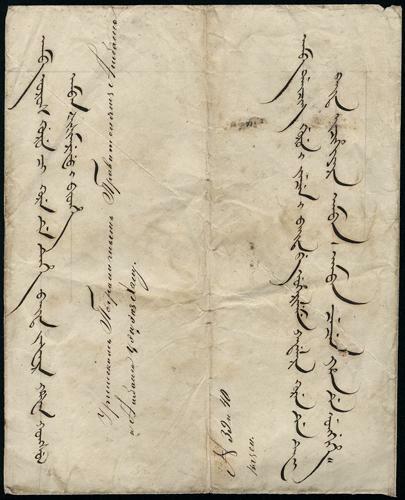 1874 Minister in Kulun to Namjildondov, assistant of Tusheet Khan Official cover, content is about ordering to resolve cases. 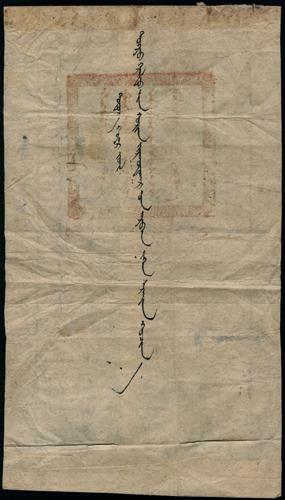 1884 stamped script from the adjutant of Sair Us military station and Ministry for Case Resolution, people carrying this script went from the Sair Us station through the station of Altai road in order to reach the capital city. 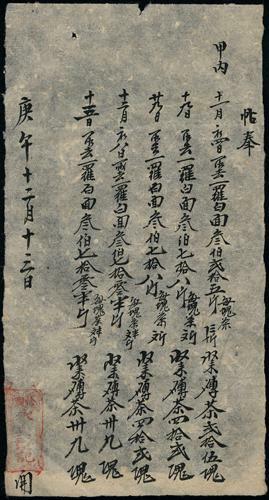 It is written on the script that "there are nine soldiers,….pieces of horses and sheep and etc." 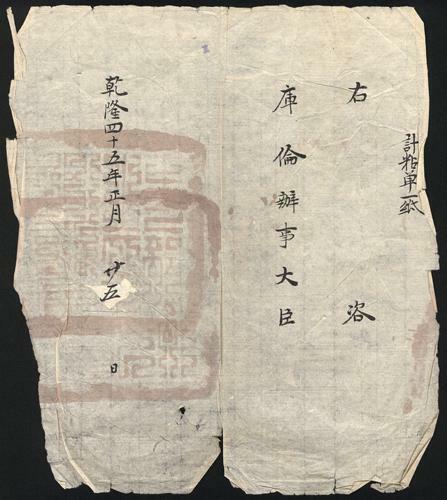 1896 Bird cover from the guardians of the soum station, rnrn1896 Bird cover from the guardians of the soum station, written with "it is outside letter of your General Kheibei. It is prohibited to delay in its road even for little bit". 1896 an accustion script to local governmnet by a civilian, content describing the tyranny and corruption of local official. Interesting. 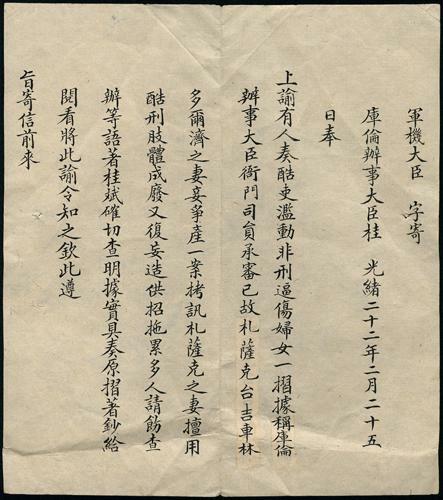 1896 Grand Councilor to Minister of Kulun letter, content is about the Grand Councilor ordering the Minister of Kulun to seriously investigate the case about the tyranny of local official. 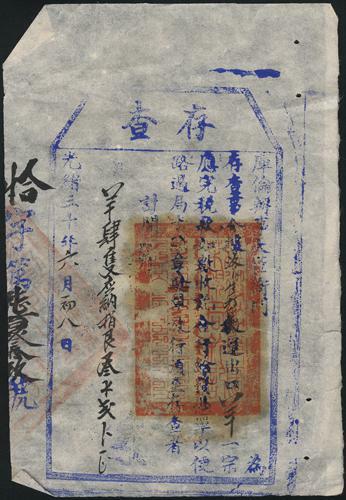 1904 two tax payment certificates issued by Minister of Kulun, Suitable for border commercial activity studies. 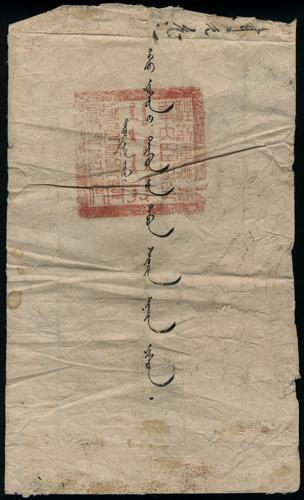 1909 Officialcover from Minister in Kulun to Urtnasan, the governor of southern station, rare.